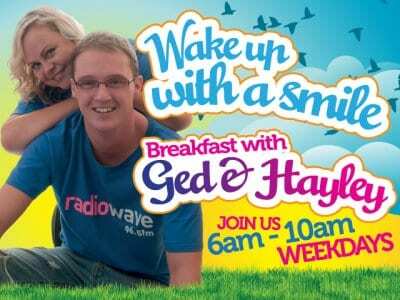 I’ve finally found someone who gets up as early as I do, as we’ve been prodding into the early morning world of being a breakfast presenter on our great Fylde Coast Radio Wave, with ‘Ged and Hayley at Breakfast’. So go on then guys, let’s have a competition to see who gets up the earliest. What time of day do you get up to bring us the breakfast show every morning? Ged: Ok two answers here, the alarm is set at 4:50 but I get up at 5:15am – plenty of snoozing! Hayley: I’m more disciplined than Ged – most days I get up around 5, unless I’m really tired then I also play the snooze game til about 5:15! Ged lives in St Annes and I live in Marton, so our drive to work is probably quicker than yours because there’s not much traffic at ungodly hours! You can’t be regular night owls then if you get up at that time, so what time do you go to bed? Ged: I usually go to bed about 10-10:30, it does have an impact on your social life, with sport clubs usually finishing at 10pm and things like quiz nights that can go on until 11pm. I can cope with the odd night but a few nights a week and you would become very tired. Hayley: You must have more stamina than me then Ged, I like to be in bed for 9pm every night and aim to be asleep for 10ish. Getting up early means evening cinema trips are out of the question, I have been known to nod off in the past, so now teatime is the latest you’ll catch me sat in the back row! Most kids say they want to be a fireman or a nurse or a vet, and yours is a more unusual career so how did you get into being a DJ? Ged: I joined Radio Wave at 18 pretty much straight after college, but I cut my teeth on hospital radio and DJing at my local social club. Hayley: I started DJing in 1996 at the Palace Nightclub after the manager Peter Clarke asked me to step in & cover for one of the jocks who’d left – they must have really liked what I did because they kept me on. 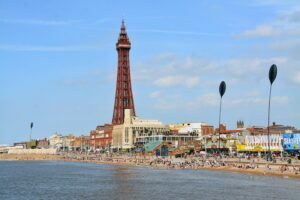 I’ve been lucky enough to work at some of the Fylde Coast’s best venues over the last 16 years.  In terms of radio, I started at Radio Wave in 2000 covering overnights – which makes early mornings a doddle! With all the reality TV and Big Brother making ordinary people famous, today’s kids have more ambitions to be famous than they did years ago. If a youngster thought that DJing was a route to stardom, what should they be doing to get into the profession? Ged: There aren’t any particular qualifications that you need to be a radio presenter, but there are many radio courses at college and university which are brilliant at learning the industry, giving you editing skills and much more. That can’t be a bad thing to stand out from the rest if there’s more competition for each job. Hayley: Yes, I agree. The right personality and ability to talk and think on your feet is vital, but any experience that you can get or qualifications you have just makes you stand out from the rest. You’ve been entertaining us for a while now with your hilarious double act as we all drive to work and go about our jobs in a morning. 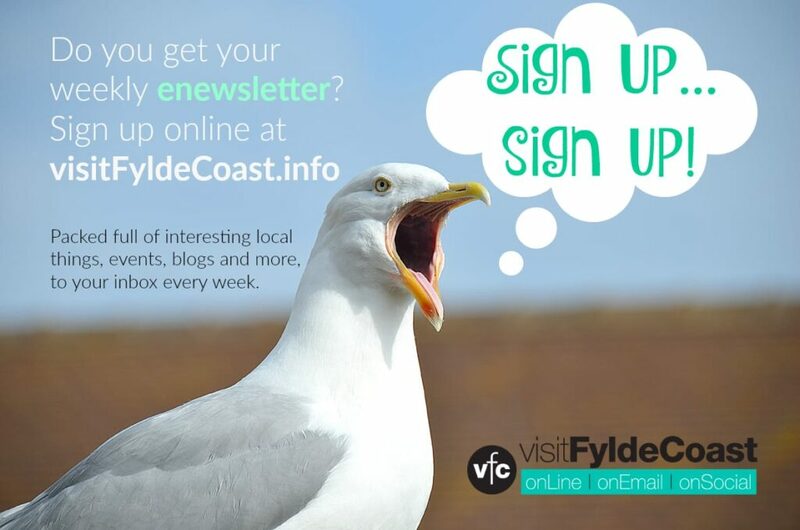 If you upset the Fylde Coast and left your posts, how would you like us all to remember you? Ged: Hopefully they will think that I’m a good laugh and made their journeys into work a lot more enjoyable, and cheered them up at times when they were down. Hayley: I agree with that too Ged! I’d like to be remembered for not taking myself too seriously, I think I’ve got a pretty memorable laugh too. Life’s too short to not enjoy it! Time is flying by so quickly that one week just turns into another and before you know it it’s Christmas again! So before it whips round to 2022, where do you see yourself in ten years time? Ged: Good question. Definitely still in radio whether it’s in a management role or still presenting – or better still, both would be great. Hayley: Mine’s a more girlie answer – I’d like to be happily married with a family. I’ve seen inside a modern radio station and they look a lot like the launch pad for the space shuttle! Without a degree in Astro Physics, what kind of difference has all the technology made to your job, and how on earth did you learn how to use all the gizmos? Ged: Technology has been massive in our industry. Back in the day when I started at 18 in 2001/2 we were using CD’s, and of course before that it was vinyl and cartridges. I suppose like in many other industries, the introduction of technology has meant that man power has been cut, but the technology has made radio more exciting and hopefully a better listen for everyone. Hayley: So does that make me older than you then Ged? When I started DJing, 12 inch vinyl’s were what DJ’s used and I was in the minority using CDs. Now pretty much all DJ’s use laptops, and I guess I just picked it up as I went along. At Radio Wave, everything is played from a computer system now, but when it was first installed about 10 years ago, we were all trained in how to use it. Ged is much better at using all the gizmos than I am! I always listen to Wave when I have the radio on and enjoy all the music and banter. You must be experts in all kinds of tracks, but what’s your personal taste like in music? Ged: To be honest anything that sounds good to my ears, anything from classical to R&B, my favourite band at the moment are Vampire Weekend (which are not as bad as they sound…). Hayley: I’m the same, I like loads of types of music, everything from Oasis to Stevie Wonder, The Courteeners & The Human League. I actually love live music & try & get to gigs as often as possible. We have a bit of a toilet thing going on here at the Rabbit Patch, so I’ve got to ask you, in your shift while you’re live on air, how on earth do you manage to go to the loo? Ged: You have to be quick, you have about 3 minutes to do what you need! Hayley: Ah you see, I box clever and make sure I’m playing a long song or nip off during an ad break! You have a great on-air relationship and it’s hilarious listening to you wind each other up like an old married couple. Do you see much of each other outside work? Ged: Yeah we have done in the past but not much now though because a lot of events are at night so it’s hard to get out when you have to be up early. Hayley: We both have busy lives outside of the show, but we text a lot though! I suffer from ‘foot-in-mouth-itis’ which isn’t so bad when there are only a couple of people to hear it. When thousands are listening you must be aware of saying the wrong thing. Have you ever had any really embarrassing moments or said something awful on air? Ged: Touch wood nothing serious. My most embarrassing moment had to be throwing up whilst I was on air, put it this way there was a lot of music played during that hour! Hayley: I think I embarrass myself regularly, I also occasionally put my mouth into gear before my brain’s had chance to catch up, but I don’t think I’ve ever said anything too bad on air. It must be great to get to meet celebrities and interesting people, have any of them really stuck in your mind as being good or bad? Ged: We’ve had some great interviews, JLS, Michael Buble, Olly Murs and so many more who are great to talk to. My worst one was Steve Coogan, I love all of his work but out of character he was such hard work to talk to, it was like pulling teeth! Hayley: Things aren’t always what you expect either, I remember Girls Aloud back in 2004 were rude, particularly as we’d taken a competition winner along with us to meet them; ironically JLS were absolutely lovely! And finally, the question we always ask everyone, where do you go on holiday? Ged: Anywhere hot, my last 3 have been to America, I love everything about the place. Hayley: I go to Lanzarote at least once or twice a year, my friends have an apartment they very kindly let me use, I’m very lucky!